Princeton researchers have been studying neutron stars and their astronomical signatures for decades. 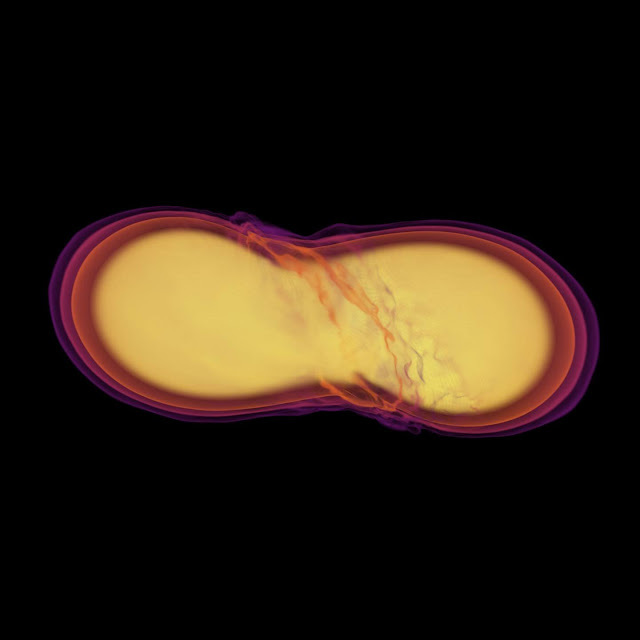 The gravitational waves were the first evidence of the neutron star merger to arrive at Earth, followed by a gamma-ray burst that arrived 1.7 seconds later. He was referring to a set of back-to-back papers by Bohdan Paczynski, the late Lyman Spitzer Jr. Professor of Theoretical Astrophysics, and Jeremy Goodman, a 1983 Ph.D. graduate who studied under Paczynski and is now a professor in the department. In their articles, Paczynski and Goodman argued that colliding neutron stars could be the sources of gamma-ray bursts, a mysterious, short-lived energy source first identified by satellites in the late 1960s. "Bohdan Paczynski was absolutely right," said Goodman. However, his ideas were not immediately embraced by the field. "I remember going to a conference in Taos, New Mexico. … Bohdan gave a short talk on his idea that gamma-ray bursts are coming from cosmological distances. I remember these other astrophysicists … they were respectfully quiet when he spoke, but regarded him as a bit of a lunatic." He added, "Bohdan Paczynski was a very bold thinker." The possibility of colliding neutron stars that had prompted Paczynski and Goodman's discussion first surfaced in a 1981 paper by Joseph Taylor, now the James S. McDonnell Distinguished University Professor of Physics, Emeritus. His 1974 discovery of binary neutron stars with his then-graduate student Russell Hulse, who later worked at the Princeton Plasma Physics Laboratory, was awarded the 1993 Nobel Prize in Physics. They showed that the two neutron stars they had spotted were separated by about half a million miles and orbiting each other every 7.75 hours. That's the demonstration that Gubser and Pretorius provided as they described how black holes (or neutron stars) collide—an astronomical marvel that LIGO has now detected five times. At a recent talk for their book, The Little Book of Black Holes, published by Princeton University Press, Gubser and Pretorius used a disk about three inches across instead of a quarter, so their audience could more easily see and hear the disk's slow but steady increase of speed.